ANT and ANT+ network basics in M2M,IoT | What is ANT+? This page covers basic features of ANT+ technology.It covers ANT and ANT+ network concept used in M2M and IoT(Internet of Things) applications. ANT is the open access multicast WSN technology designed, developed and marketed by company called ANT wireless. It operates in 2.4GHz ISM band and operates at ultra low power. ANT+ is the successor to basic ANT protocol with interoperability functionality added. ANT+ is promoted and maintained by ANT+ Alliance. ANT+ takes benefits of low power and low cost transceiver devices available. It supports various network configurations such as peer to peer, tree, star, mesh topologies and network to network connections. It has fast over the air transfer rates. ANT network consists of nodes and channels. ANT Nodes are Physical devices and ANT channels are communication channels. Unlike most synchronous networks, which will expect central node to be master of all nodes in the network. ANT allows master and slave devices to be defined on the per channel basis. 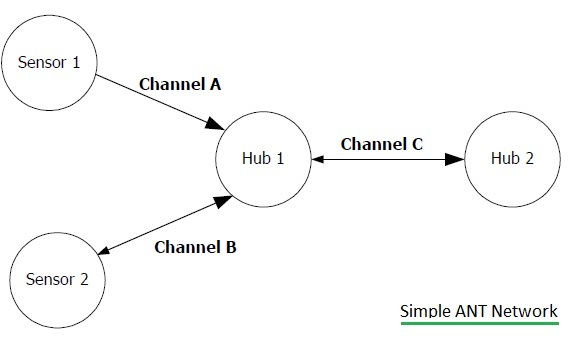 Hence a node can be master of one channel and slave of another. This provides greater flexibility in the network. • Master must transmit in every channel period. • If there is no data to be transmitted, master simply broadcast previous data by default. • Slave devices once its channel is opened it will immediately start search for the master. Once the master is found it will stop searching and synchronize to that transmission and receive every channel period. • The slave detects drift and alters its phase to have maintain perfect synchronization with the master. • Similarly master device can detect transmissions from other masters in the same space and alters its phase to avoid a collision. • The slave will also detect the shift and adjust its timings to match with master. • Hence this way, ANT allows synchronization and coexistence. ANT packet consists of 8 bytes excluding overhead. Data is always exchanged from master to the slave on each channel period in unidirectional mode. The slave device optionally support data transfer from slave to the master in bidirectional mode of data transfer.